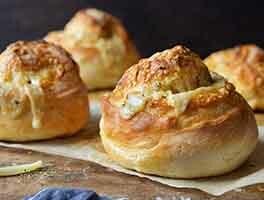 These soft, savory rolls are equally delicious in the dinner bread basket, or for sandwiches. 2 hrs 28 mins. to 3 hrs 50 mins. Soften the dried onions in the water for 30 minutes or so. Add the remaining dough ingredients, and mix and knead by hand, mixer, or bread machine, until you've made a slightly sticky, shiny dough. Place the dough in a greased bowl, cover, and let rise in a warm spot for 45 minutes to 1 1/2 hours, until almost doubled. 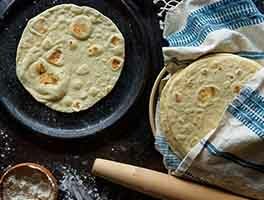 Transfer the dough to a lightly greased or floured work surface and divide it into 12 pieces. Roll each piece into a ball, and dip the tops into seeds. If the dough is dry, spritz with water and sprinkle with seeds. Cover and let rise 30 minutes to 1 hour, until almost doubled in size. Preheat the oven to 375°F while the rolls are rising. Bake the rolls for 15 to 20 minutes, until they sound hollow when tapped and feel firm to the touch; their internal temperature should be at least 190°F. Remove the rolls from the oven, and cool on a rack. Store cooled rolls wrapped in plastic, at room temperature. For deeper color, add 1 tablespoon cocoa powder to the dough along with the flours. I love rye bread but though any rye I have tried in the past was good (of course! it was homemade! ), but not better than what I could buy. I have to admit my local supermarket bakery makes very good rye. However they have stopped making it except on weekends and then only in a round loaf which isn't good for sandwiches. I made these rolls recently, using pickle juice for some of the liquid as someone else suggested, and they were wonderful, probably the best rye flavor of any rye I have made. I also agree with an earlier reviewer who said not to omit the topping. I didn't have vital wheat gluten so I substituted bread flour for the all-purpose. I am going to try these as a loaf. I have the hearth rye pan that you used to sell but I don't think this will fill it up enough. Any suggestions on increased proportions? 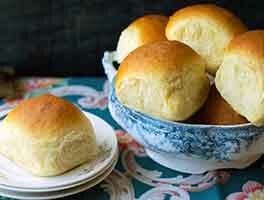 These rolls are terrific! Nice and soft too. I substituted pickle juice for 1 cup of the water and cut the salt down to 3/4 teaspoon. I also used 100 g of first clear flour and 198 g AP instead of all AP flour. Wonderful texture and delicious flavor! agree with the others, caramel coloring not necessary. adding molasses is a good idea. i had my own bagel topping that i made by a google search. agree the size is either too big for a regular roll or too small for a sandwich. Just made these today to go with some turkey vegetable soup I made post-Thanksgiving. As I didn't have dried onion, I subbed chopped scallions and dill. I lowered the salt by 1/4 teaspoon and added some Vermont Cheese Powder and a little pickle juice. I added some Artisan Bread Topping to the dough as well as on top and subbed a tablespoon of molasses for the caramel color. The rolls came out a beautiful medium brown and were very tasty. Next time, I'll sprinkle some salt on top also. Wonderful rolls. Made as directed, except shaped into 16 smaller rolls for a dinner bread basket. 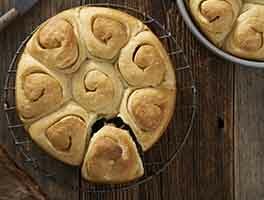 These rolls are relatively easy to make and the results are deli-delicious. I substituted sunflower seeds for onions and dipped the tops in pumpkin seeds. Served with Swiss cheese, they disappeared before the oven had cooled down. I made 12 for dinner rolls and will make 16 next time, as they were still a bit large. 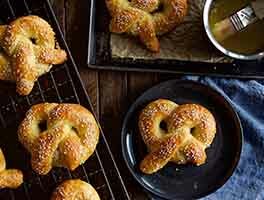 I didn't have the caramel color, but since I dipped them in poppy seeds, they didn't really need it. They were delicious. 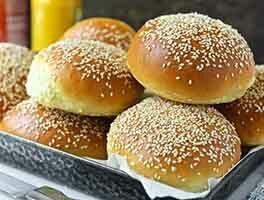 These rolls are delicious! I had no caramel color and no flavor, so I added 1 tablespoon of dark honey instead and reduced yeast to 1 3/4 tsp.